The Scottish novelist Robert Louis Stevenson said, ‘Do not judge a day by the harvest you reap, but by the seeds you plant’. 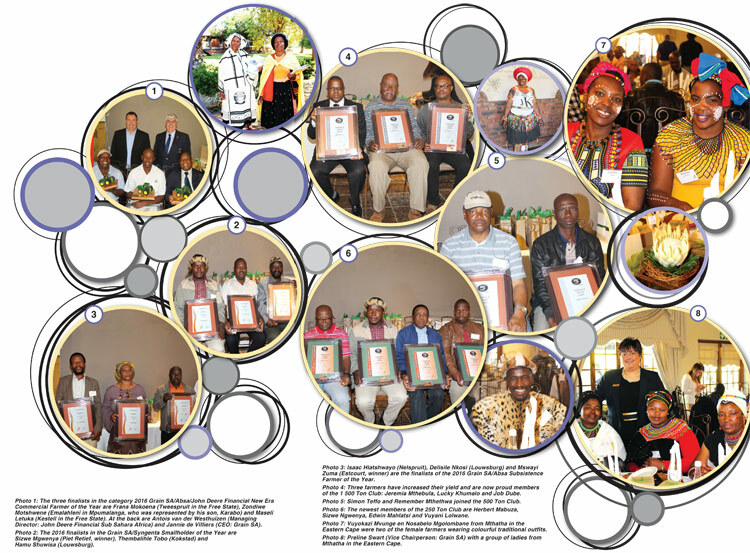 Commercial producers who are involved in Grain SA’s Farmer Development Programme may not have had a harvest to yield the past season as a result of the drought, but at the Day of Celebration it was clear to see that the seeds of knowledge planted under their mentorship have had an enormous impact in the area of farmer development. 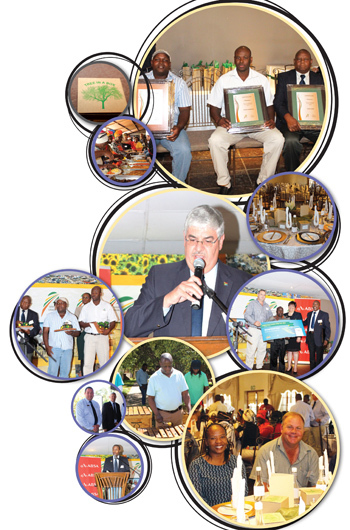 On 22 September this year more than 250 guests including government representatives, agricultural stakeholders and approximately 160 emerging grain producers attended the Day of Celebration in Bloemfontein. The category sponsors were represented by Antois van der Westhuizen (John Deere Financial), dr Langa Simela (Absa AgriBusiness), Antonie Delport (Syngenta) and Clara Mohashoa (Monsanto). All nominees had shown growth in their farming operations through input from the Farmer Development Programme and their hard work was acknowledged at the event. This programme proves that increased knowledge on weed control, soil health and seed selection can have a dramatic impact on farming operations. All nine finalists mentioned how important the input from this programme had been in achieving success. Grain SA is very grateful to the sponsors who make this programme possible: The Maize Trust, Winter Cereal Trust, Sorghum Trust, OPOT, AgriSETA and Pioneer. The 2016 Grain SA/Absa Subsistence Farmer of the Year was announced as Mswayi David Zuma (66) from Estcourt in KwaZulu-Natal. David and his wife, Goodness, work as a team and despite the late rain harvested 22 tons of maize from 8 hectares which they planted by hand. An ambitious young man, Sizwe Innocent Mgwenya (31), from the Piet Retief area received the award as the 2016 Grain SA/Syngenta Smallholder Farmer of the Year. Sizwe is building on the 50 hectares of land he received from his father. He yielded 250 tons of maize this year all harvested by hand. His success is a result of excellent soil management including conservation practises and a strong focus on pH and nutritional balancing. The three finalists in the category 2016 Grain SA/Absa/John Deere Financial New Era Commercial Farmer of the Year are Maseli Letuka (Ladybrand), Zondiwe Motshwene (Louwsburg) and Frans Mokoena (Ladybrand). Each finalist received a voucher from John Deere Financial which they can exchange for a piece of farming equipment from John Deere. The winner was announced at the Grain SA Grain Producers of the Year gala event on 14 October in Midrand. The winner will once again receive a John Deere tractor sponsored by John Deere Financial in partnership with Absa. Jane McPherson (Manager: Farmer Development, Grain SA) thanked the friends of the programme – those individuals who support the programme to ensure its continued existence. Grain SA CEO, Jannie de Villiers expressed his gratitude to every developing grain producer who is willing to be mentored and taught, thereby ensuring a growing harvest of grain producers each year. After experiencing a difficult season on their own farm Jenny Mathews (producer from Sannieshof and previous chairman of the board of the Grain Farmer Development Association) shared a special message of encouragement with farmers. ‘Coping with a season like this one has been a roller coaster.’ She said, ‘A season like this has brought our farmers to their knees, but life goes on. We have a hungry nation to feed and we still are the people with the power in our hands to produce food.’ She encouraged farmers to follow the advice of Psalm 121 and to ‘look up’ and not to dwell on the negative and concluded with an African proverb, ‘However long the night, the dawn will break’.